The Essential Bible Companion to the Psalms provides fundamental information regarding the meaning, background, context, and application of the Psalms. In addition to practical application, numerous charts are included that provide information about the various types of psalms (messianic, prophetic, etc.) along with a quick reference list of psalms that lend themselves to being used for worship or personal meditation or as a basis for praying the Scriptures. Through the use of full-color visual images, the message and world of the Psalms are brought to life in a way never before presented, making this book not only an excellent resource for understanding the Psalms, but a wonderful gift as well. The Essential Bible Companion to the Psalms is a must-have for students of the Bible, pastors, and anyone who desires to possess a unique reference guide to these ancient works of poetry and worship. About "The Essential Bible Companion to the Psalms"
Brian L. Webster (Ph.D) is Associate Professor of Old Testament Studies at Dallas Theological Seminary. He did his doctoral work at the Hebrew Union College-Jewish Institute of Religion. He is a homeschooling father of four and a Youth Leader at his church. Customer Reviews For "The Essential Bible Companion to the Psalms"
The volume is well laid out, with a brief introductory section providing background information about the structure of the collected Psalms, dealing with types, authorship, themes and usages. Then each Psalm is dealt with on one page under the headings of theme; type; author; background; structure; special notes; and reflection. Obviously this means that Psalm 119 and Psalm 133 are dealt with in the same amount of space, which is, in itself, an interesting contextualisation, but demonstrates the authors’ commitment to providing an introduction to, and overview of, each psalm and not an exhaustive examination. The layout is inviting and the use of larger fonts, full colour and stock photos all seem part of an intent to engage the reader. But there seems to be a major problem with this book. Though the book is not meant to be the final word, or every word, it does present itself as a ‘done in one’ companion. Applications of Psalms such as 22 or 110 mention that the New Testament looks back on their words in identification, but don’t engage with the idea that the words actually anticipate and find fulfillment in the person and life of the Lord Jesus. Promises in the Psalms seem applied to the immediate context of David and his generations and we are then invited to trust in the God who was faithful to them when we endure similar circumstances, just like Jesus did. It’s because of this oversight that I’m reluctant to recommend the book. Together with other reference materials its insights are a useful supplement, there are many interesting and accessible observations contained within it. But as a starting point, or ‘essential’ companion, it is sadly lacking an essential point of reference to understanding the Psalms: messianic expectation. 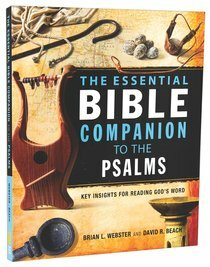 Review copy of The Essential Bible Companion To The Psalms was provided by Zondervan.